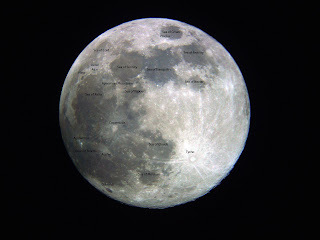 The above Lunar image is my full November Moon. Taken with my BIG scope not my computerized scope, my BIG scope allows me to take wide angle pictures of the Moon, and at these cold temps if I were to turn on my computerized scope it would blow up and then start on fire. Taken last Friday night during a break in the clouds. The November full Moon is called the "Full Beaver Moon", a name given it by early Native Americans because it was time to set beaver traps before the swamps froze so they could gather a good supply of furs for the winter months, another reason for the name is the beavers are actively preparing for winter. I have also labeled my Moon with most of the major seas and some major craters and a couple mountain ranges, gives you an idea where everything is. Ever wonder why we only ever see one side of the Moon? To really understand this concept you have to stick a loved one, cat or plant in the middle of the room and look the loved one, cat or plant in the eye, stand 3 feet or so away from them and pretend you have a surprise behind your back you don't want them to see. Do a complete circle (orbit) around them until you are back at your starting point. Notice what you had to do with your body to keep your back and surprise away from them, you had to rotate your body in the direction of your travel around them exactly 360 degrees. That's what the Moon does, it rotates on its axis one time for every orbit of the Earth to keep its alien bases surprise from us. Technically we are locked gravitationally into a synchronous rotation/revolution pattern with the Moon. NASA just released a couple days ago images of Mar's moons Phobos and Deimos. Taken by CRISM (Compact Reconnaissance Imaging Spectrometer for Mars)Probe. CRISM is mapping Mars geology as well as looking for water and as they put it "Help locate Martian resources that could provide local support for eventual human exploration and colonization of Mars". 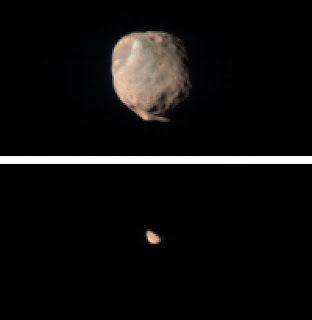 Phobos, top image above is a captured asteroid and is on a slow collision course with Mars, slow as in 50 million years. Deimos is also a captured asteroid and the smaller of the 2 moons. Okay now take a look at our lovely and beautiful Moon, as in the top image I took above, now take a look at the second image of Mar's moons, need I say more? I'm just saying our Moon is an oddity not only in the way it was formed by a collision of two planets but also because of how beautiful and mysterious it is. The above clip has my best 74x images of Comet Holmes, notice the size of the comet getting progressively bigger until it is bigger than my field of view of my scope set up. I played with with the last 2 images in photo shop to get below the debris layers to see what was going on again with the nucleus. The photo shopped versions really show how uniform the expansion of the debris field away from the nucleus is, very cool, also notice the green color in the second image, this is carbon monoxide gas, a by-product of the explosion/impact fluorescing in the sunlight. 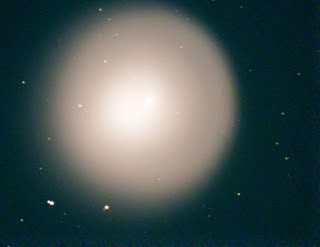 Scientists still don't know the exact cause of Comet Holmes outburst which increased it's brightness one million times, there's 2 major theories; the comet was hit by an asteroid or due to the repeated warming of the comet's nucleus the protective ice subliminated exposing a piece of the nucleus which then exploded shooting 100 millions of tons of dust into space. 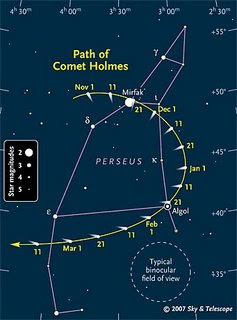 Comet Holmes is now moving away from us, it is 250,000 km distant, as you can see from above image it will be moving in the sky as well, you can now spot it on the other side of Mirfak in the constellation Perseus. It is actually getting harder to see because even though it's overall brightness has remained the same at around 2.5-3.0 magnitude the light is spread over a greater distance as the comet continues to expand from tens of thousands of miles across to now several hundred thousand miles across. Better get out and enjoy it while you can, won't be around for another 6.88 years and chances are unless it gets hit by an asteroid or has another explosion, you will not be able to see it, in other words, this could be a once in a lifetime event! JD over at The Uneasy Supplicant , who by the way has an amazing blog, check it out, has awarded me with "You're an Amazing Blogger" award, I proudly accept this award. Awards are always good to get, shows that someone out there appreciates what you are doing. I will now pass this award on to some of the amazing blogs that I visit regularly, give them a try, from photos to the paranormal to totally useless stuff, it's all here. I don't usually give out this many awards, but it is Christmas time and to date I hadn't gotten these people anything, so, "MERRY CHRISTMAS!" One final note, the The Saskatchewan Roughriders won the Grey Cup last night, we are all pretty proud here in Saskatchewan! 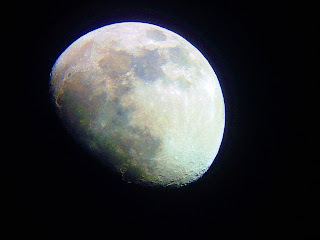 Very happy, got a break in the clouds and was able to snap some images of the Moon a couple nights ago! It has been cloudy, cold and snowy here what seems like forever so when I got the opportunity, carried my big A_ _ ( hint, not arm) scope up the stairs and outside the front door to snap some quick pics before the clouds come back, which they did after about an hour. It was cold out, about -10c but that's good, less turbulence in the air, on my Moon shots there is more detail, the ray system of both Tycho and Copernicus really stand out. I put my camera on the highest quality setting to squeeze as many pixels as possible out of it to see if I could draw out the colors of the Moon by saturating it in photo shop. The image below was the result. My best attempt to date. The blues/greens such as the Sea Of Tranquility, (the blue color sea top center of the Moon), represent Lunar basalts high in metals such as titanium, thorium and iron; the rust colors are metal poor basalts like the Sea Of Serenity , just to the west of the Sea of Tranquility and one of the eyes of the famous face on the Moon; the white colors represent the continental highlands platform ejecta, consisting of anorthosites containing some aluminum and finally the bright white areas are recent impact ejecta. Notice Tycho crater, the bright white crater bottom right of the Moon with the extensive ray system, scientists believe that the impactor which hit the Moon and created Tycho was the result of a collision between 2 asteroids in the main asteroid belt between Jupiter and Mars and they also believe that same collision created another impactor which in turn hit the Earth 65 million years ago and caused the mass extinction of the dinosaur. Well right about now you're probably wondering as I am how you got from a guy taking a picture of the Moon in his front yard to the mass extinction of the dinosaurs, don't ask, couldn't tell you, I do this on the fly a lot of times, hope you find it interesting. I was reading an article the other day about how odd our Moon is, odd in the sense that our Moon was probably created by our Earth colliding with a Mars size planet about 4.5 billion years ago, the rocks and dust that were blasted from the collision formed the Moon. Scientists are saying this only happens 5-10% of the time. 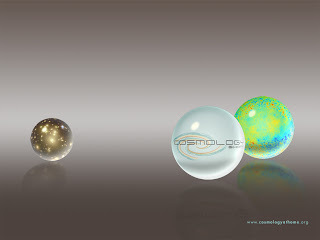 Planetary systems are usually formed side by side or planets acquire their moons by gravity. Just when I thought I'd have to wait until February/08 to watch Astronauts walk on the Moon I happened to be surfing the net and found a newly released DVD called " Magnificent Desolation Walking on the Moon ", it's tag line being, "Only 12 have walked on the moon, YOU'RE NEXT". So within a half hour I had picked it up and double bonus just as I arrived at Rogers they were unpacking Guitar Hero III for the PS3 which I picked up for my boss, you can not find this game anywhere in town, so killing two birds with one stone made both of us happy and made 10 bucks in the process, the tip from the Boss. The movie is Narrated by Tom Hanks and you can't go wrong with Tom Hanks as a narrator, second only to James Earl Jones in this category, oh and both Tom Hanks and Steven Spielberg are the executive producers. Buzz Aldrin the second man to walk on the Moon and the Apollo 11 Lunar Module pilot actually coined the phrase "A Magnificent Desolation" when he stepped on the Moon , magnificent for the ability of man being able to go to the Moon and desolation for the extreme desolation of the Moon. There is a lot of rarely seen footage on this DVD, some of the astronauts would be walking along just talking to capcom (capsule communications from Earth) when they would trip over a rock or just trip up and fall, quite funny the amount of times this would happen, never saw this on the live versions. Another very interesting thing I learned from this DVD is that the Moon played visual tricks on the astronauts, because there was no buildings or trees on the Moon the astronauts perspective was out of sync, they had a hard time telling how big or far away things were, example, Capcom was asking the Apollo 15 astronauts about how far away they were from Hadley Rille, they replied they weren't too sure but estimated about 50 metres, right after that they were surprised when the edge gave way and it started to slope down to the bottom of the Rille, now Hadley Rille is a gorge comparable to the Grand Canyon, yet they couldn't see it coming, I found that very interesting and as they put it they had to be very careful because of it. Overall a very good movie, if you like the Moon and space travel it is a no brainer pick it up. There is a newly released computer network sharing program called Cosmology at Home. Works on the same principle as SETI at Home, you donate your computer's free time, resources and bandwidth for the greater good of either looking for aliens as with SETI or help solving the mysteries of the universe with cosmology at home. Some of the things you will be helping research with cosmology at home are items such as the universe acceleration, distribution of galaxies and fluctuations in the cosmic microwave background, right now as I'm doing this post I am also looking for new pulsars as well as aliens, no flys on me! All you do is go to their web site and download their interface a program called Boinc and you're good to go. You don't have to do aliens or cosmology stuff there's numerous research programs you can help with, such as temperature patterns if you're in to global warming, to researching malaria. 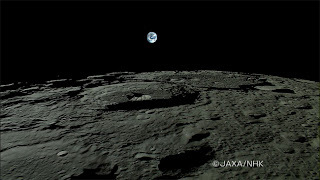 The Japanese Moon Probe Kaguya has sent back stunning images of an Earth rise, the above picture and Earth set the below picture. Notice below in the Earth setting picture the Earth appears upside down, visible is Australia and Asia. The images were taken 62 miles above the Lunar surface. Bonus for us Canadians, the Discovery Channel HD in partnership with Japanese broadcaster NHK will be showing Return To The Moon which is about the probes mission to the Moon and will show the most current images. This program will be repeated throughout the coming weeks starting November 14/07. I will be PVRing mine this afternoon while I'm at work, very cool. 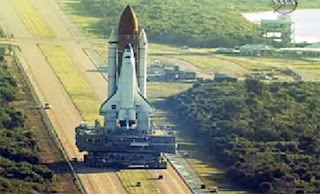 The Shuttle Atlantis made it's 7 hour 3 mile journey to it's launch pad in preparation for the December 6th. launch. This will be the 24th shuttle mission to the ISS. Atlantis's main mission will be to install the European Space Agency's Columbus module which will be dedicated to long term space research. The Google AdSense ads have been working out great for me! 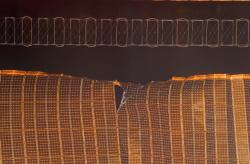 So far I've purchased a 9.95 Earth rise Hi Res print, and 2,000 satellite TV stations for my laptop for only 50 bucks. the one ad said "Shocking discovery they don't want you to know", well who doesn't want to know what they don't want you to know? So now I have 2,000 satellite TV stations on my PC AND I now know what they didn't want me to know, check and mate, sometimes my own intelligence amazes even me. I will leave you with a video I put together on Lunar travel using my Tycho perspective image, duplicated over and over again with the perspective changed a little each frame to give the illusion of moving over the Lunar surface. 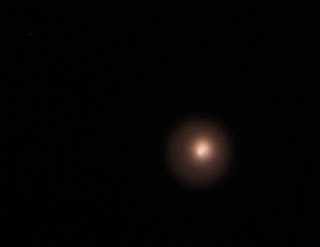 Hot off the presses, my latest image of Comet Holmes taken last night. It is composed of 80 images at 10 secs for each image and the best stacked together. I then processed it in photo shop using the shadow/highlight feature to remove the whites of the dust particles to get underneath the exterior dust to see what was going on with the nucleus, I then increased the levels of the other colors to get a false color image showing the highly magnified nucleus releasing particles to feed it's ever expanding tail, isn't that just too cool! I put the before and after photoshopped images into a little clip above and entitled it, that's right "Comet Holmes Tail". Comet Holmes is moving away from us now, and is also moving in the sky as well. Last night it appeared much closer as in the above image to the star Mirfak, and the comet will in the next few months make a semi-circle around the constellation Perseus. The best time for viewing is right now while there is a nearly new moon and the comet is still in it's bright phase, who knows how long it will last. Also on the site where you can purchase the framed prints is a Trailer for David Sington's directed documentary "In The Shadow Of The Moon". I definitely want to see this movie but it probably won't be released here in Saskatoon, have to wait for the DVD release February 12th. 2008. 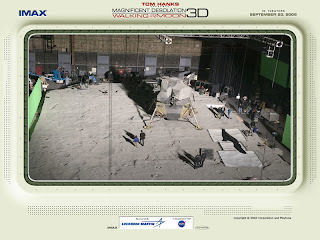 The film is a documentary about the astronauts who circled or landed on the Moon between 1968 and 1972. One astronaut said as he was standing on the Lunar surface looking back at Earth "I felt that I was literally standing on God's front porch" I am going to leave you with another one of my flying over Tycho perspective images. 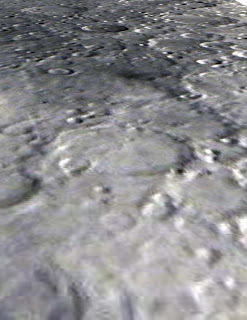 Tycho is the crater top center of the image with a Central peak. Imagine with me if you will, you are orbiting the Moon in spaceship Boba at about 150 miles distant from the Lunar surface traveling 2,000 mph on your way to Tycho City (Tycho is the crater at the top of the image with a central peak), and you look out your window and snap an image, the above image is what you'd see, no it's not taken by a lunar probe or any of the Apollo missions, it is one of my highly magnified lunar images, I figured out how to change the perspective of an image in photo shop so that it looks like your flying over the Lunar landscape as opposed to looking at it through a telescope. I was going through some of the images taken by lunar probes and the Apollo missions in Virtual Moon Atlas and thought it would be cool if I could get the same effect on some of my images, so after many hours of fooling around with the free transform edit tool in photo shop I was able to come up with a totally different viewpoint hence the above image. You may ask why would I spend all that time doing that, I ask why not, it looks cool, takes me away even further then I already am from our Earthly constraints to a place where you can imagine the impossible, besides a had a few hours to kill the other night. The Shuttle Discovery arrived home safely yesterday at 1:01 pm. EST. after a successful and complex mission. This is space exploration at its finest, from the ability and ingenuity of being able to develop things like cufflinks to repair one of the International Space Station's solar arrays to preparing the Space Station for further space exploration with the installation of the Harmony module, this is why I blog so much about the Shuttle program, these people are making things happen up there so we can reach for the Moon and beyond, they are our modern day Columbuses! Okay this is just too cool. 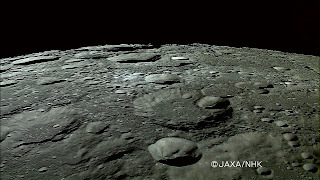 Japan's Lunar orbiter Kaguya has just sent back high definition Images of the moon along with a HD Movie. The movie has 2 sequences, one of the Lunar polar area as in the above image, and another sequence of the Oceanus Procellarum region. 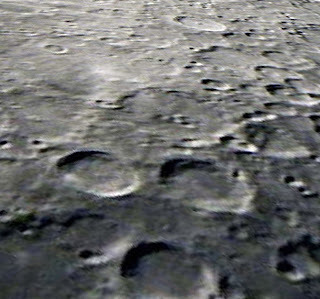 The images were shot about 100km from the Lunar surface, how exciting is this?! 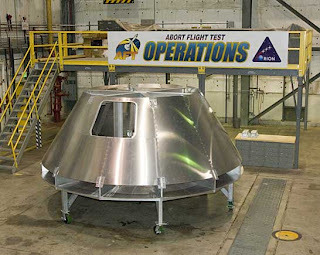 NASA's Dryden Flight Research Center's Fabrication Plant released a picture of a mock up of the Orion crew module. It is America's first new manned spacecraft since the shuttle was developed 30 years ago. The Orion is part of the Constellation Program which will return us to the Moon by 2020. Astronauts on the Shuttle Discovery have completed repairs on the solar array successfully using the home made cufflinks and are heading home. 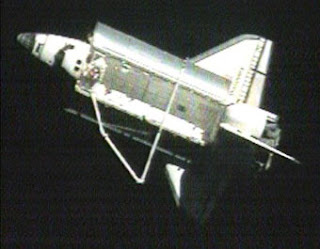 After the Shuttle Discovery undocked from the ISS they performed the 360 loop around the space station to take one final look to ensure nothing is about to fall off the station, it also allows the station's crew to take final images of the shuttles heat shield to analyze later for damage, which is now standard practice ever since the 2003 Columbia disaster. As the astronauts were leaving the ISS yesterday while closing the hatches Clayton Anderson noticed a ding on one of the shuttle's thick windows, NASA doesn't anticipate any complications from this, apparently the window was struck by a micrometeorite. Below is a picture of one of the cufflinks used to repair the solar array. 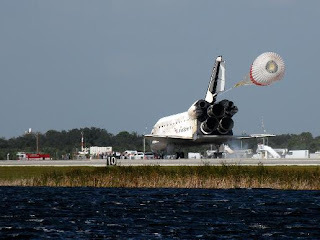 The shuttle will be landing at Kennedy Space Center,Fla. 1 pm.EST Wednesday. There are a couple of good meteor showers coming up in the next couple months to watch out for. Late evening on November 17th. through the morning hours of November 18th. sees the return of the Leonids meteor shower. The source of the shower is the parent comet Tempel-Tuttle discovered independently by William Temple in December 1865 and Horace Tuttle in January 1866. Look for the radiant, the place where the meteors seem to start from low in the NE. sky around 11:30 pm November 17th. that's where and when the constellation Leo rises. Leo will continue to rise until early morning bringing with it 20-30 meteors an hour. The best viewing of celestial objects is happening right now. I was up at 5am. Saturday morning, it's hard to put into words, the sky was full of gems. It's like all the players showed up for the performance of the century and I was the only one invited. Venus starts off the show a bright white gem low in the east; Saturn next, a bright yellow ball a little higher in the south east; a little further west was the Moon followed by Mars high in the south; west of Mars was the open star cluster the Pleiades and then just north west of the Pleiades is Comet Holmes. These are all naked eye candies, don't need a scope to view this stuff people, it was a busy quite, if that is even a term, it was remarkable! I am going to leave you with a compilation of my best Comet Holmes images I took from October 25th to November 2nd. all at 200x. I put them all together in windows crappy Vista operating system's "Movie Maker", but that wouldn't upload properly, duh, Vista, so I uploaded to You Tube and embedded it to my blog. WARNING!! !, if you have an irrational fear of a comet crashing into the Earth destroying life as we know it, don't push the play button! Also just a note to let you all know I will be posting every Monday and Thursday nights from now on. Saturday November 3rd. 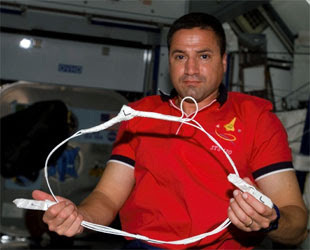 astronauts on the shuttle Discovery mission STS 120 will be making what they are calling the most difficult and dangerous spacewalk ever attempted. 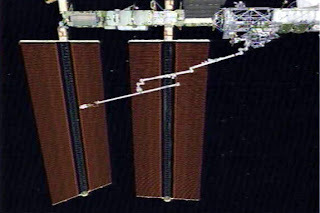 During the mission's third spacewalk which consisted of moving a large solar array panel on the " P6 truss" which by the way weighs 35,000 lbs, as they were extending the array astronauts noticed a couple rips in one of the panels. They immediately stopped the extending process fearing more damage and took pics to send home. The array is 80% deployed, is still generating 97% of its full capacity but NASA scientists are saying it is structurally unstable and must be repaired. The plan is to "button-up" the two rips with "cuff links" which the astronauts crafted with supplies found in the station's lab. Astronaut Scott Parazynski will be attached to an extension, attached to the Canadarm (above picture), take the one hour ride out to the problem area and effect repairs. What makes this mission more difficult is that as Scott Parazynski is repairing the array there is a possibility of electrical shock as the panel is supplying 110 volts, generating 13.4 hp. and there is no off switch, once the array is deployed it's on. Comet Holmes continues to get bigger! It's like I found a new toy, every night I look forward to getting out and viewing the comet. What is really unusual about this whole situation is that I have had clear skies almost every night since the comet increased a million times in brightness. If you haven't yet, get out and take a look, very easy to spot now, as it gets dark look to the NE half way up from the horizon, you will see a fuzzy yellowish ball, that's the comet. 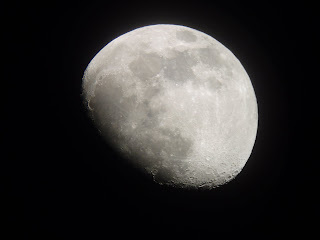 I'd like to have you all over to show you what it looks like through a telescope, it is too cool, if you can get or borrow someones binoculars do it, who knows how long it will last, maybe only a couple more weeks, enjoy it while you can. Below is the first image I took last Wednesday October 25th. at 200x, below that is my most current one taken October 31st. at just 74x. Notice the green halo around the comet on my most current image, that is fluorescing gases mostly carbon monoxide, one of the byproducts of the explosion. Rose over at World Outside my Window , who by the way helps many people out with her tips and knowledge on blogging, has honoured me with the "Community Blogger Award" It is awarded to people who reach out and make the blogging community a better one. Again I thank you Rose and will proudly display it with my other awards along the side of my blog. I would like to pass on this award to Shirley over at Way Cool Pictures. Shirley always brightens up my day with cool pics from around the globe, and on her blog as you scroll down has a "Thank You" and a picture of a smiley cat, and I love cats, so she gets the award.